Well I have started doing some of the work that does not involve the car right now. 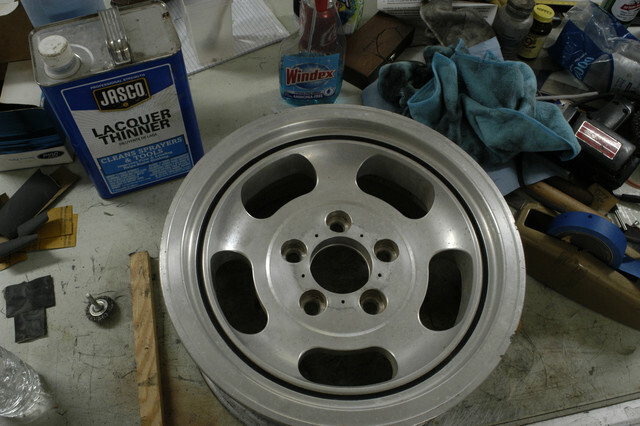 I pulled some of the 1973 Forged Aluminum wheels down and have started cleaning and polishing them. 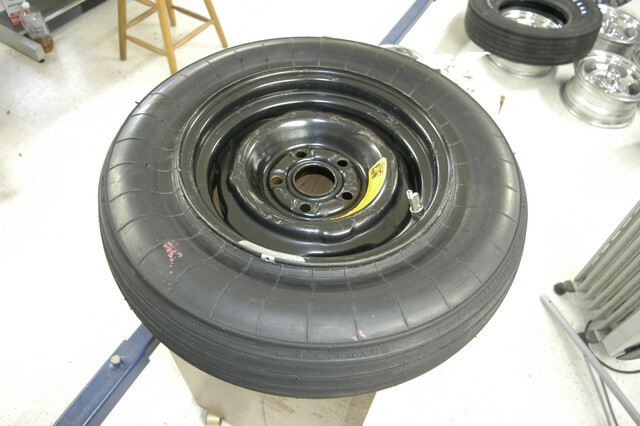 So let me state some facts on the wheels. 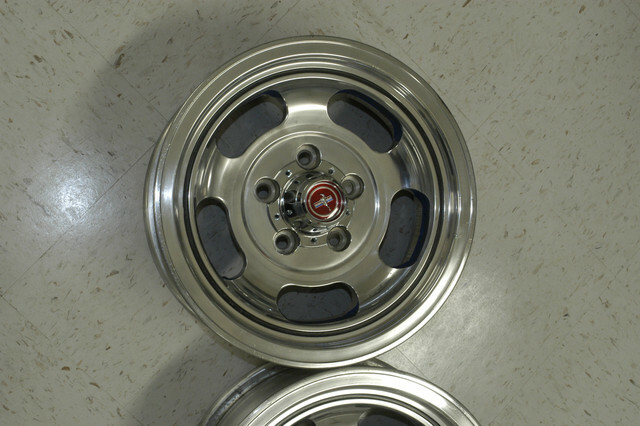 Marti says that there were 10,106 total Mustangs made in 1973 with the Aluminum wheel option. 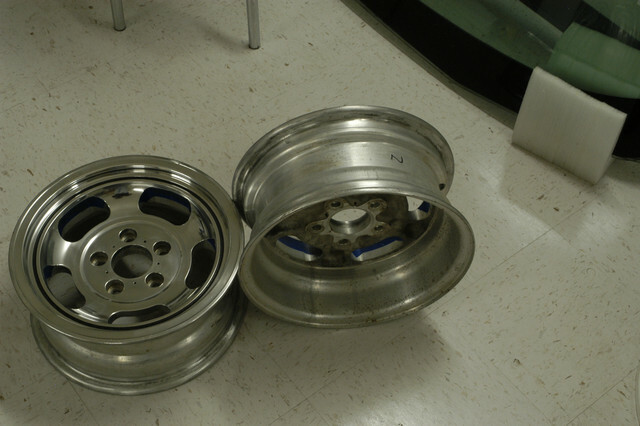 Mavericks got the exact same 7" wide by 14" wheel with their own center cap. 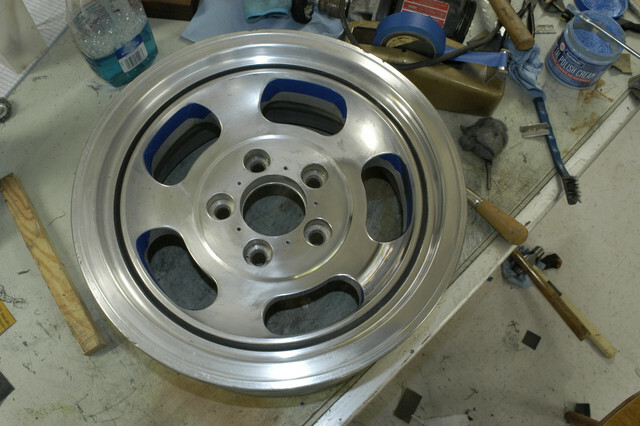 Mercury also used two different variations of this wheel with the only difference the center hole is larger to clear the larger hubs on a Mercury. 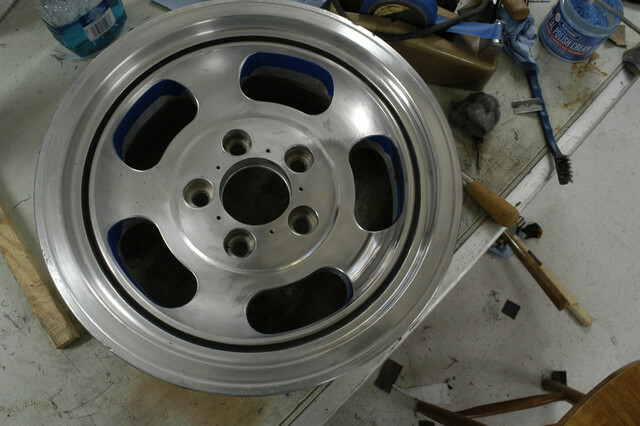 Not to miss lead anyone on how the wheels should look they were never polished from the factory. They were high speed turned using diamond tooling. They did not have any clear coat on them either. 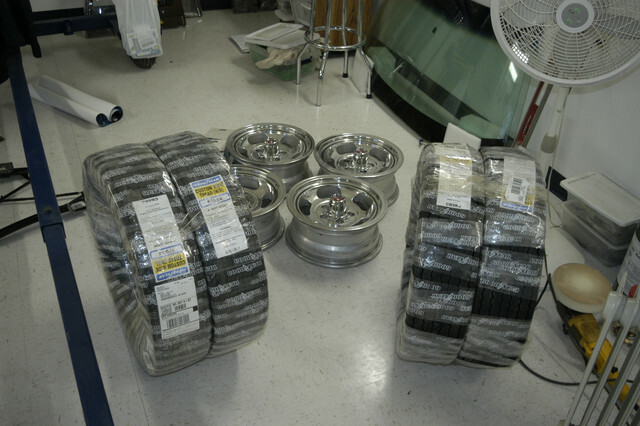 I did investigate having them turned again and the quote came back several hundred dollars per wheel. 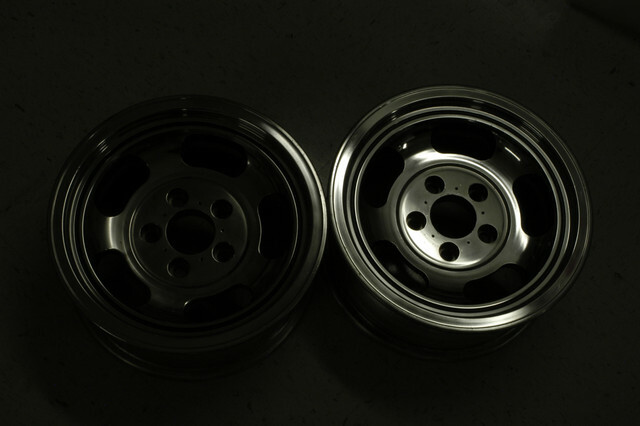 I do not have that kind of money to put into wheels so I will polish. I got two done Monday in about 4 hours and almost got the other two done yesterday and had to quit. The process I am using is as follows. Wash the wheel inside and out with Dawn. Then wash with lacquer thinner to get any road tar off. I blast the back side of the wheel with ground up walnut shells using 90 lbs. air pressure in cabinet. 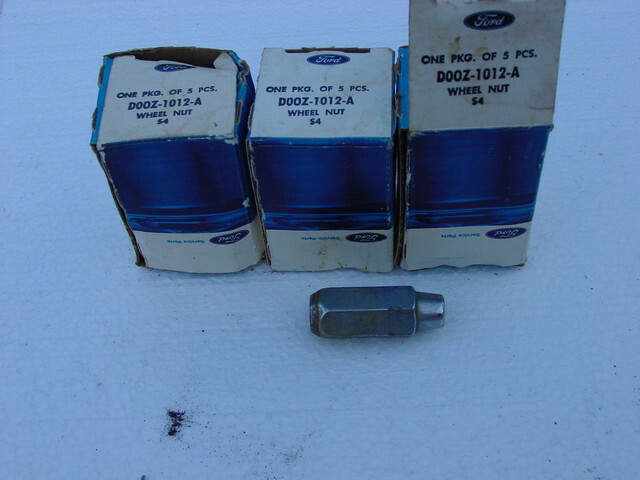 This also cleans out the lug bolt holes and around tire valves. 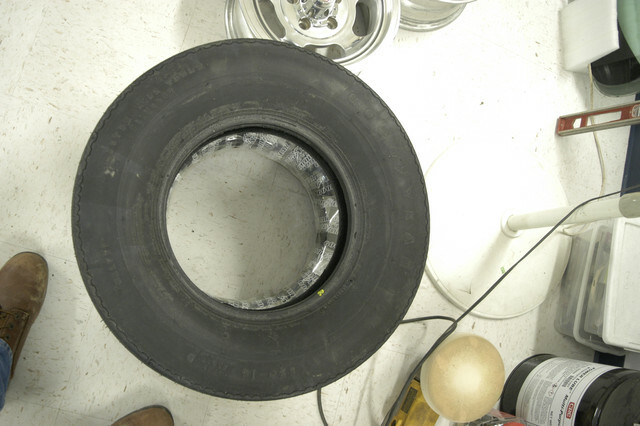 I wire brush the sealing bead area to remove any bits of tire left there. 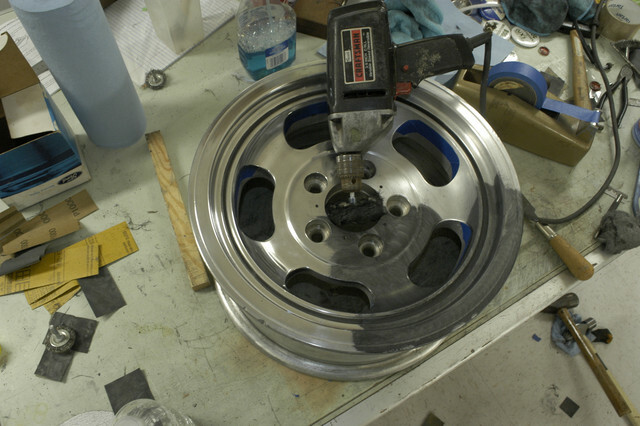 I wet sand the face of the wheel with 1,200 grit paper. I file any rough spots. I did mask off the 5 slots that have a Mill finish to prevent polishing them. 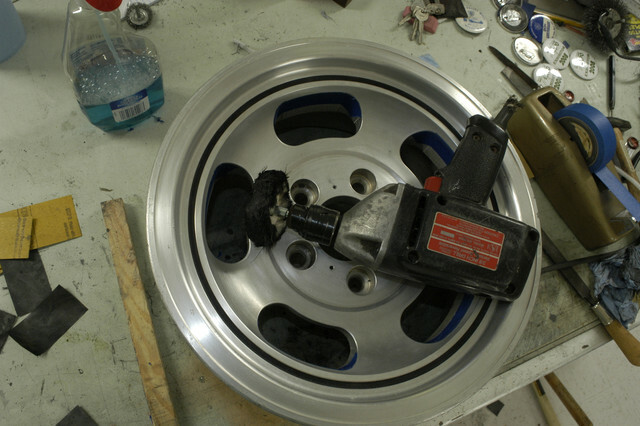 Then I polish the wheel using 3/8" electric drill and cotton buffing wheel and Blue Magic Mag Wheel Polish paste. I wipe down with window cleaner and micro fiber towel. I will put some new black satin paint in the detail ring around the outer edge. 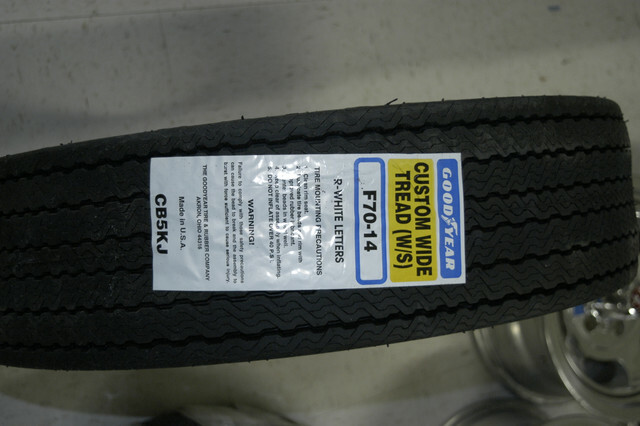 Will be getting a new set of Goodyear Polyglass RWL tires F-70-14" like came on the car. When I get them mounted of course I will set all of the fill valves in same place and the tire logo the same on all of them. 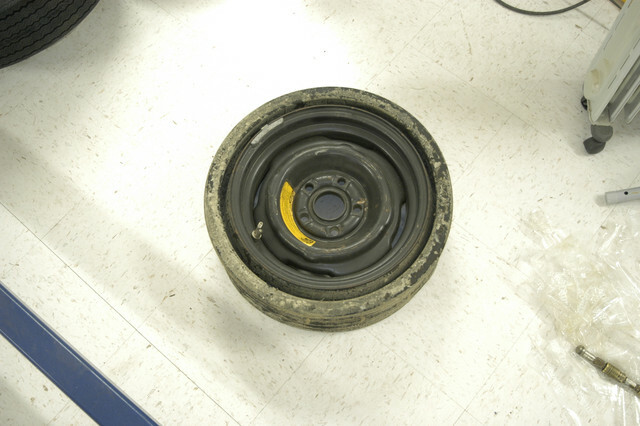 Since it will sit in the museum for a while I will add RTV around the fill valves and also around the bead of the tire to keep them from slowly leaking down. I have a set of NOS wheel center caps also. The price on the boxes was $14.00 each from a vendor at swap meet years ago. Originals have 5 screws and some of the replacements had three screws. They do repo them. Only have a couple of broke screws from the caps. Soaking in penetrating oil and will drill from the back side. Will use stainless and anti seize going back on. I will build actual stands that will keep the weight of the car off the tires while on display. Will look like they are on the floor but no weight on them. I did get a reply to my ad on Craigslist for help doing the cleaning. He came and visited the other day. He is a former Ford mechanic but has had to retire early due to MS. He wants to keep busy and is willing to help. When we move the Mach 1 in the new garage will remove hood, fenders, grill and everything on the front. Will run all the suspension parts through the molasses tank. Engine and drive train will be pulled and engine compartment will be detailed. 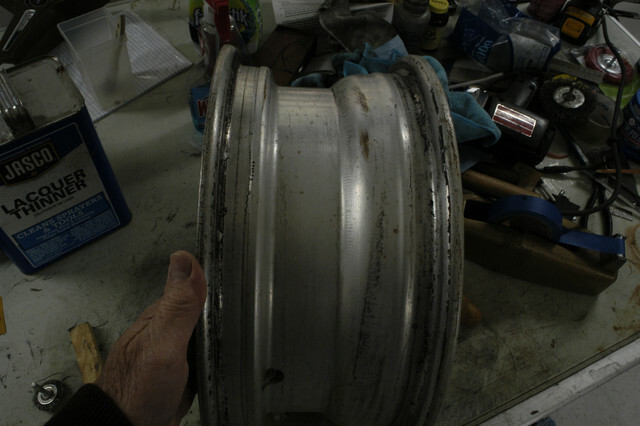 There will be no restoration done only clean and detail. One of the cars that will be in the museum is another Barn Find. A 1964 1/2 that has been in barn for many years. They are tearing the barn down and bringing to the museum to put back up. BTW I was puzzle at how few cars they could get into the museum. It turns out that Daniel Carpenter will be using the second story and will not be used by the museum. 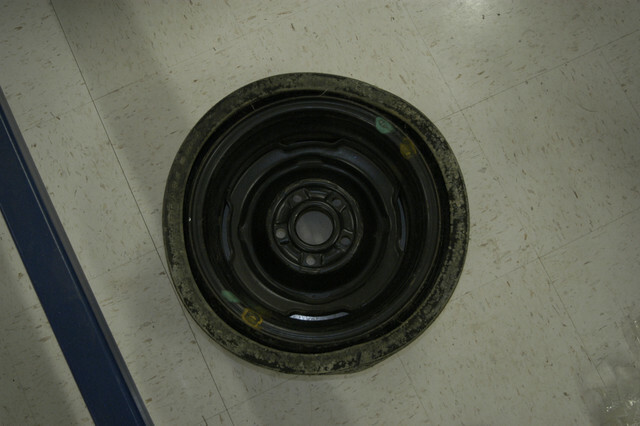 So I only have about 1/4 of the last wheel to buff out. Works out to a little less that 2 hours per wheel. These were i pretty good shape so went pretty fast. One thing I found out is that the Mustang emblem in the wheel centers is not always in the same position so when I have tires mounted and indexed to same position related to the tire valve I cannot do the same with the center caps. I guess they just dropped them in and staked them and did not worry about position of rotation. If you are going to do this note in I think the last picture I put plastic electrical tape on the drill chuck to prevent hitting the wheel with the steel chuck. You do not need his speed rpm to polish especially with the Blue Magic paste. 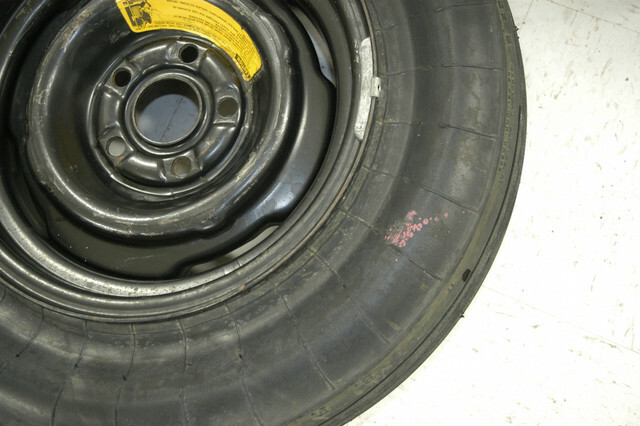 Lots of truckers use it on their big truck wheels. Will also work on your aluminum trim once you get the anodizing off. 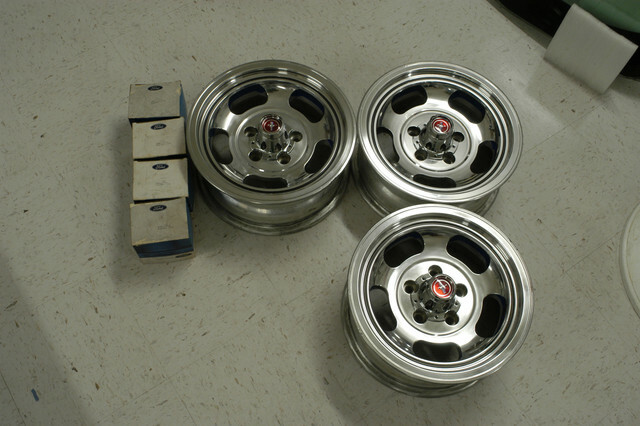 Does anyone have any NOS lug nuts for the wheels? Part # DOOZ-1012-A I need 20 new ones if I can locate or rework existing. Looks great. And thanks for the tips. When I get started on my 73 vert I will be doing this at some point as well. Daniel carpenter built / owns the building . He will use the second floor to store inventory. He is leasing the first floor to the guy who is making the Museum. (10-31-2018, 10:52 AM)OMS Wrote: Daniel carpenter built / owns the building . He will use the second floor to store inventory. Yes I knew Daniel owned it talked with him last April when there. He was telling me how he saved $87,000 by placing the order just before the new tariffs kicked in. I was just under the impression the whole thing would have cars. He will probably move his mustang collection over to there it was packed in the other building. His dad is also out of room. The place is one big maze that just keep adding to, lol. Are you going to be removing the dash from the car? 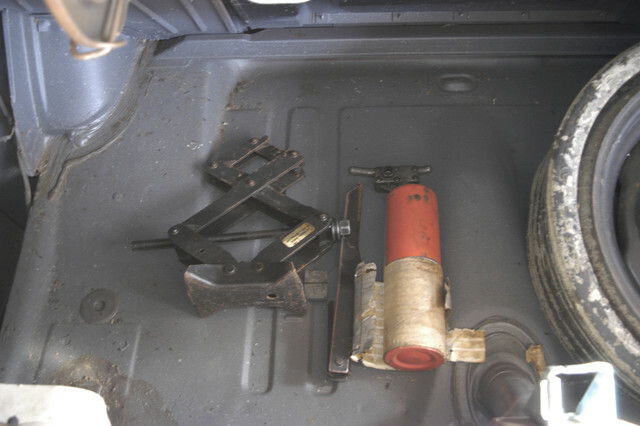 If so, I would really like it if you could make a template of the plastic and jute insulation above the pedal support and under the cowl. 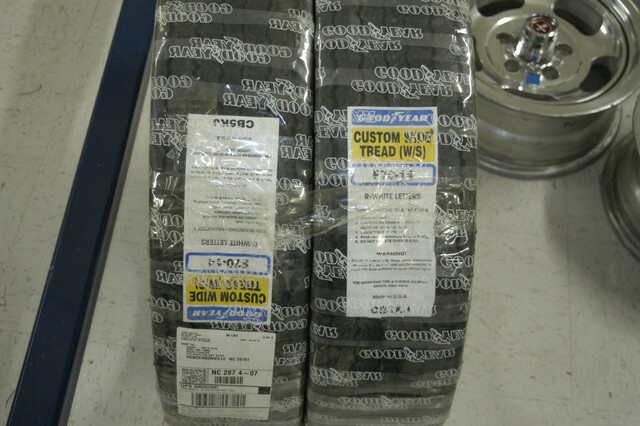 I ordered the Goodyear F-70 X 14" RWL E-S tires for my Mach 1 last week and they came yesterday. Look great as they should for what they cost, lol. 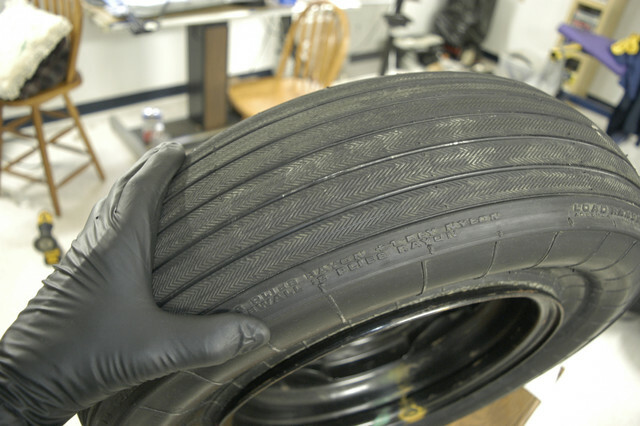 I got them from Kelsey Tire. 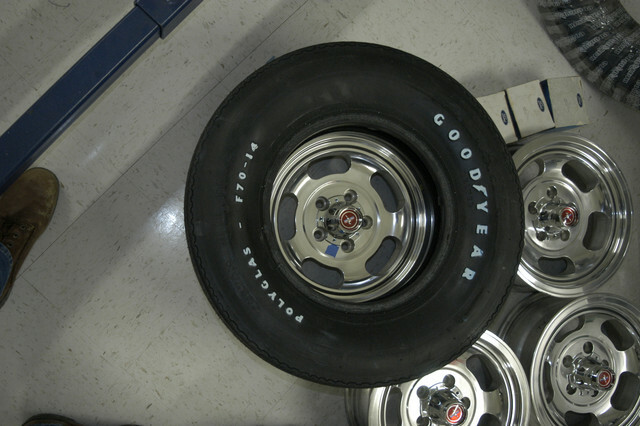 Coker does not have any of the Goodyear molds so they are only source. Here is link if you need them. Direct from them was the best price I found Summit and Ebay have them but was more. Little over $100 to ship also. Last quote to get my drive to garage fixed from all the rain and get the water going right way is over $9,000 I have sticker shock. Got one more coming to quote. We are due to get snow today and tonight and get some of the cold you guys have had up north lately. Will get them mounted and ready to go on the car. Only about 80 days left to the opening of the museum. 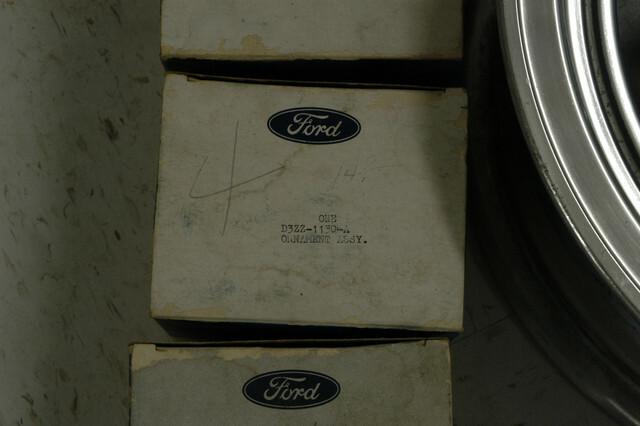 The older Mustangs that were made before December 31, 1969 had F-70 X 14 RWL N/S which did not have the tires size in raised white letters only the Polyglas. 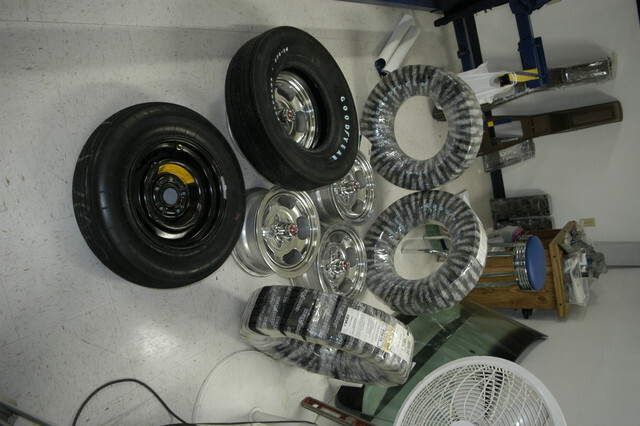 There were some of them on another site I checked Lucas Classic Tires and they were NOS Goodyear not repo. That might be pushing them for anything but show car. One other item I need is the Positive battery cable. I cannot find my original Red one that I took off and put up somewhere. Who makes a repo that is correct with Red and looks correct? Who still has the repo Autolite or Motorcraft battery? Mine had the big battery the original is also stashed somewhere in the pile, lol. Those wheels and tires look great! So I have the official invitation letter from the MOM, Mustang Owner's Museum so time to get serious. I cleaned and detailed all the stuff in the trunk today. 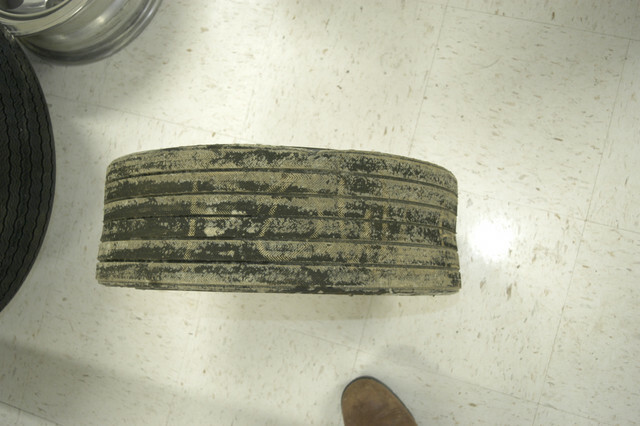 The space saver spare had grown some interesting mold maybe a new vaccine to prevent me from buying Mustangs, lol. I washed with Dawn and also Bleach White, the old formula and then scrubbed with that great standby lacquer thinner. 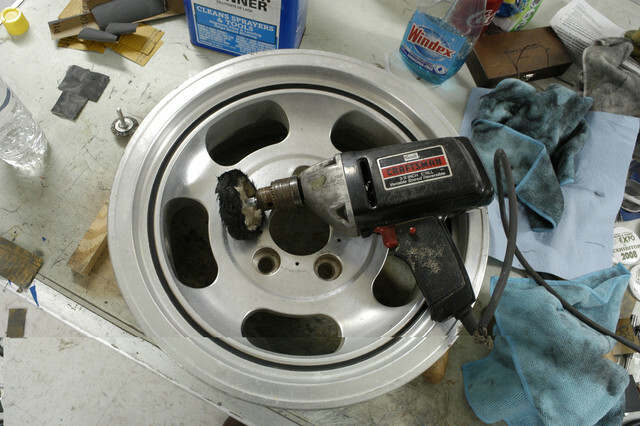 I went over the jack with fine steel wool and the lug wrench also. Still has the sticker on the jack. 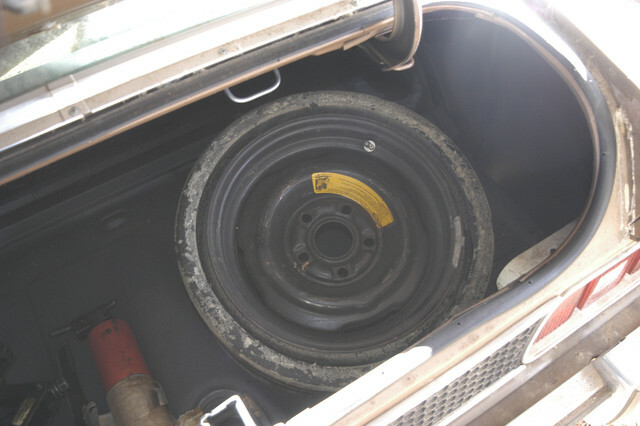 Take note of the Purple or violet paint dabs on both the inside and outside of the space saver spare. The wheel also has paint dabs on the back side. I was cautious inflating the thing first time it has ever been pumped up. Sat in sun to warm up some but has no visible cracks always been in the dark trunk no UV to kill the rubber. It has never been on the ground. 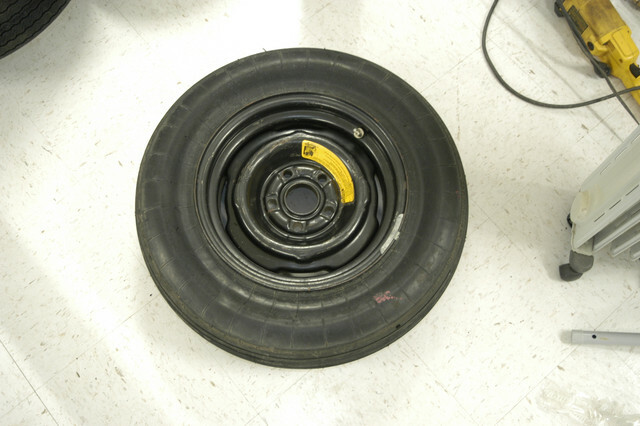 When I took it in for the recall, they were cutting peoples heads off, they wrote my name on the tread with grease pencil and will not come off easily so I will leave it. 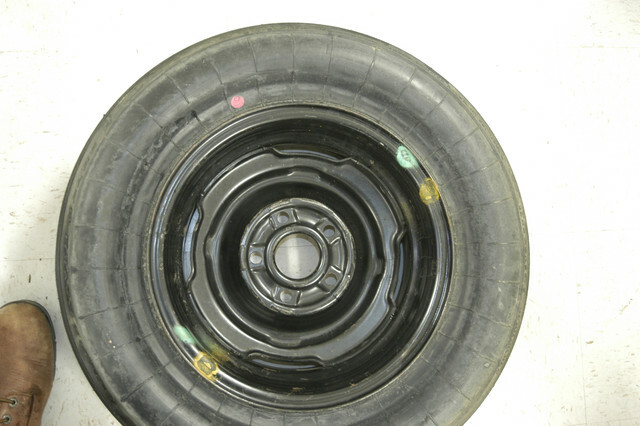 Somehow the valve stem cap is missing. 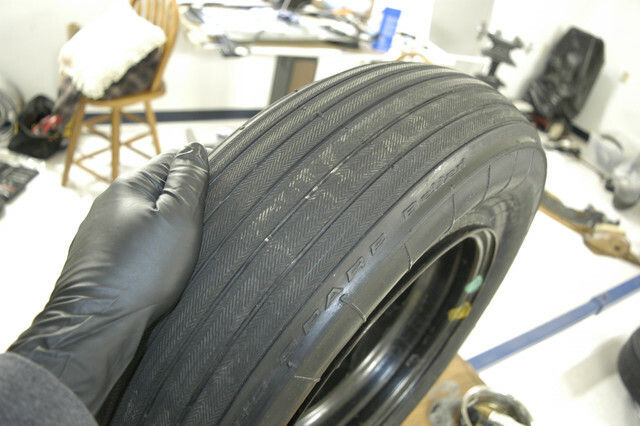 Has the split end so you can unscrew the valve stem to let air out. Seems like it was white plastic. Someone might have taken at a show in past. Or I probably put up somewhere so it would not get lost like the battery cables. So tomorrow going to attack the front brakes and get the calipers off so I can pull the car out of barn to the garage. I hope the drums are not frozen they are a real pain to get off if stuck. Lots of molasses in my future. After in garage hood off, fenders off then transmission out and engine. Will check the cylinders with bore scope and check all valves with a lever to see if stuck and go from there. Engine is easy thing the cleaning is what takes all the time. I did buy a steam cleaner not one for engines but one for the home so will give it a try. The trunk of the car is pretty much clean I will wipe down but not much detail work needed there. In the museum I will put my old set of Olin skies in with the trap door down. that is what it was for. I use to ski a lot had 190 mm. I was the guy at work that taught everyone how to ski. David the wheels look great. Thanks for the tips. Curious why you put air in the space saver? If you deflate it does it go back to normal?